I spent 2 December at a FutureLearn Academic Network meeting at the University of Southampton. The morning was taken up with short pecha kucha sessions on MOOC research, and the afternoon included three talks on the ethics of MOOCs, from Mike Sharples (FutureLearn and The open University), Jocelyn Wishart (University of Bristol) and me. Although we hadn’t coordinated our talks in advance, we managed to focus on different areas. Mike talked about the current FutureLearn approach, Jocelyn drew parallels with the ethics of mobile learning, and I drew on the work on learning analytics that is being carried out by the community (most notably by Sharon Slade and Paul Prinsloo). 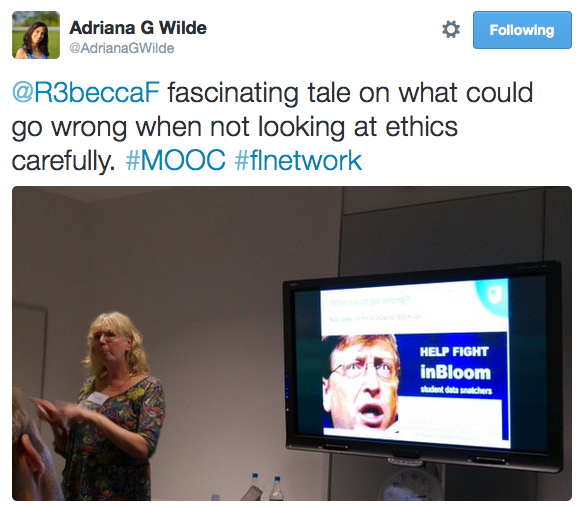 This entry was posted on December 4, 2015, 10:08 pm and is filed under Events, FutureLearn, MOOCs, Presentations. You can follow any responses to this entry through RSS 2.0. You can leave a response, or trackback from your own site.